I’m critical of identity politics both in its passive form, as theory-lite substitute for class analyses of oppression and exploitation, and in its more active manifestations. Such as when, in 2016, millions of progressives bought the idea of HRC as the self evidently superior White House contender. This despite a role in Libya that should have seen her in the dock at the Hague, and a commitment to ‘no fly zones’ in Syria that in the view of America’s most senior military officer (indeed, of any rational observer) would have brought the world closer to WW3. Such as when liberal media drip feed, into their hawkish charge sheets against Russia, Putin’s alleged homophobia.1 Or when self styled liberals vie in Guardian features to pour ordure of the vilest kind on Julian Assange, a man true progressives – God knows there’s enough of the easy kind to go round – owe a profound debt of gratitude. While the IDF tugs at our heart strings a mix of political naivety, feminism at its most superficial and good old commercial instinct co-opts itself onto the apartheid state’s agenda. Cup of Jane, which brought us the image – and tongue-in gallery playing of that women’s air force quip – is a coffee shop in Raleigh, North Carolina. Here’s its FB page, showing how its baristas dress. I neither know nor care about Putin’s views on homosexuality. I do know that whether a leader is homophobic and sexist is a hypocritical and disingenuous test for whether he should be demonised by a West whose true rulers make kings’ ransoms in arms sales to Saudi Arabia. (Yesterday morning on BBC Radio 4 I heard Emily Thornberry, touted by some on the Labour left as worthy successor to Corbyn, describe Saudi as a friend. Progressive that she is, she added that Riyadh must be given friendly criticism – “because that’s what friends do” – on human rights. Right on, Em. That’ll learn ’em! And without upsetting our arms profiteering rulers to the point where media subject to market forces grow even more hostile to any Labour leader leftways of Yvette home-flipper Cooper.) But such equations – the man’s a queer-bashing neanderthal So Take Him Out! – are seldom drawn explicitly. The realm of conscious reasoning is not the arena of choice for propaganda. Or to be more precise, not in the formative stages of opinion manufacture, when a degree of subtlety is still required. Think I am going to puke. I’ve a healthy stock of sick-bags myself, Jacalyn. 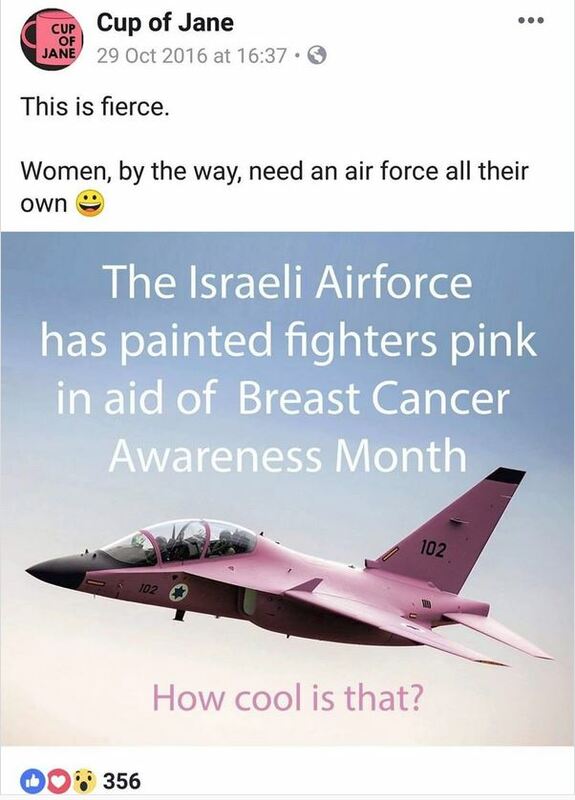 I wonder if the Israei jet fighters had been painted pink when they massacred children on a Gaza beach would have impacted negatively on the fight against breast cancer or have those who fawn over Israeli Lebensraum, really have such short memories. Presumably they would also miss the glaring hypocrisy of trying to put Israel and Save The Chidren in the same oxymoron meme? My sentiments exactly, Susan. Especially those of your closing word.